Goulston synthetic filament spin finishes provide excellent friction control and customized physical and chemical properties for your processing requirements. Each of our products is specially formulated to address all the filament yarn and fiber processing requirements that can be influenced with a topical coating. Friction texturing finishes are optimized to maximize bulk levels, minimize break rates, and extend cleaning and overhaul cycles. Nylon finishes are designed to reduce the level of oligomer bloom observed with exposure to humid environments or extended storage time (aging effects). Air jet texturing products are engineered to maximize jet life. Coning oils are balanced with just the right amount of anti-sling additives to minimize housekeeping. Phase inversion viscosity is a key physical property for filament finishes. Since most spin finishes are applied by aqueous emulsion gel formation, water evaporation can cause housekeeping issues and lead to severe changes in friction properties. 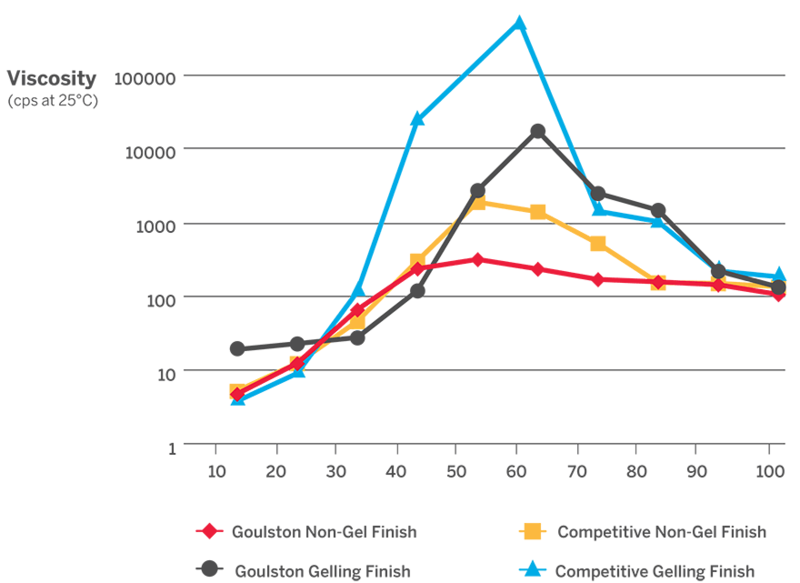 To address this issue, Goulston designed a series of non-gelling filament finishes with a very flat viscosity versus concentration curve. These non-gelling finishes are especially advantageous for air jet texturing, water jet weaving, and other processes where water is introduced. The chart below demonstrates the significant difference in viscosity between typical and non-gelling finishes.